Kilkenny is often referred to as "The Marble City" the dark limestone flagstones used for the pavements in the streets were quarried locally, at a place known as "The Black Quarry". 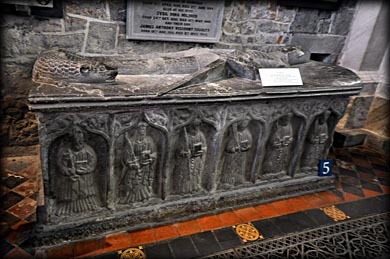 St Canice's Cathedral is home to an amazing collection of effigial tombs, mainly carved from Kilkenny Black Marble, some by the renowned 16th century sculptor Rory O'Tunny. Piers Butler (1467-1539), AKA Red Piers, was the first legitimate son of Sir James Butler, Lord Deputy of Ireland and Sabh Kavanagh, Princess of Leinster. Piers married Margaret Fitzgerald with whom he had 9 children, 3 boys, James, Richard and Thomas, and 6 daughters, Margaret, Catherine, Joan, Ellice, Eleanor and Helen. Piers also had a son outside of his marriage, Edmund, who was appointed Prior at Athassel and Archbishop of Cashel. In 1489, Piers was appointed High Sheriff of County Kilkenny. He was knighted in 1497, and in 1498 along with his wife Margaret they seized Kilkenny Castle. Also in that year, he was pardoned for his crimes in Ireland, which included the killing of James Dubh Butler, a nephew and heir to the 7th Earl of Ormond. Piers became the 8th Earl in 1515 after the death of his distant cousin, Thomas Butler, the absentee 7th Earl, and in 1522 he was appointed Lord Deputy of Ireland. Piers was forced to give up the Earldom of Ormond to Anne Boleyn's father, Sir Thomas Boleyn, after Henry VIII of England fell for her. The title was restored to him in 1538 after the execution of Anne. Piers died in the following year, 1539. His wife Margaret was a daughter of Gerald FitzGerald, 8th Earl of Kildare, and his 1st wife Alison FitzEustace, who was a daughter of Rowland FitzEustace. Piers and Margaret were also associated with the castles at Grannagh, Neigham, Ballyraggett and Gowran as well as St Mary's Church in Gowran, where some of his ancestors are buried. James Butler (1496-1546), AKA The Lame, was not confirmed 9th Earl of Ormond until 1541. Previous to that, he was created Viscount of Thurles in 1535 and Admiral of the Kingdom. James, who had once been proposed as a bridegroom to his cousin Anne Boleyn, married Joan Fitzgerald, a daughter of James Fitzgerald, 10th Earl of Desmond, in 1532. They had seven children, all boys: Thomas Butler, 10th Earl of Ormond, John Butler of Kilcash, Edward, Walter, Edmund, James and Piers. After returning from Scotland where James headed the Irish forces in the service of the King, he accused the Lord Deputy of Ireland, Sir Anthony Leger of Treason. Later James, his Steward and 16 of his household, mysteriously died from poisoning at Ely Palace in Holborn. Richard Butler (c.1500-1571), was the 2nd son of Piers and Margaret. He was created 1st Viscount Mountgarret in 1550. His first wife was Catherine Barnewall, daughter of Peter Barnewall. He then married and divorced, Anne Plunket, daughter of John Plunket, 4th Lord Killeen, in the same year 1541. His third wife was Eleanor FitzGerald, daughter of the 8th Earl of Desmond, whom he divorced in 1546. He finally married Ellen Butler, a daughter of Theobald Butler of Polestown, the illegitimate brother of his father, Piers. Theobald resided at Neigham Castle. Ellen and Richard had 5 sons and 4 daughters. Their first son, Edmund, 2nd Viscount Mountgarret, inherited the title. 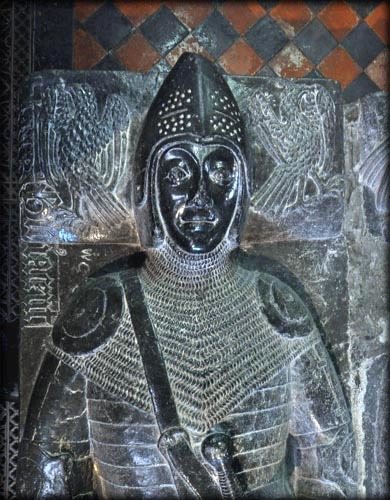 James Schorthals, Lord of Ballylarcan and Ballykeefe. The Schorthals, later shortened to Shortall, are thought to have arrived in Ireland around the time of the Norman invasion in 1169. A Robert Schorthal was granted Ballylarkin, sometime between 1202 and 1218. 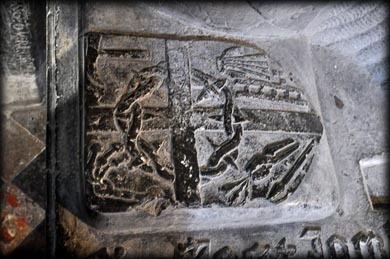 James Schorthals was Baron of Ballylarkin when he erected the family monument at St Canice's in 1507. He is also responsible for building the square crossing tower of the Black Abbey. 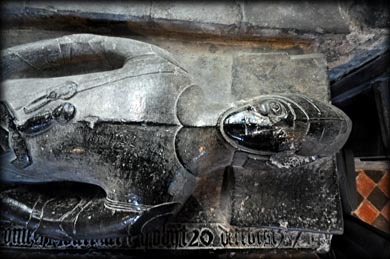 James died shortly after 1534, aged c.70 years. His son Oliver Shortall was Lord of Ballylarkin in 1549-1562. Oliver was married to Honorina Grace, the daughter of John Grace and Honoria Walsh, see below. John Grace Fitz Oliver of Grace's Court was appointed escheator of the County of Kilkenny by Henry VIII in 1516. Known as ' Iron belted Grace', John was married to Catherine Le Poer, a daughter of Pierce Le Poer. Their son, John Grace of Courtstown and Grace's County (d.1568), who was married to Honoria Walsh, was the father of Honorina Grace, see below. Another son, Sir Oliver Grace (d. c.1580) of Ballylinch Castle and Legan Castle, was married to Mary Fitzgerald, a daughter of Sir Gerald Fitzgerald, 3rd Lord Decies. Before he was knighted, the older John Grace erected Grace's Chapel in 1543, at Tullaroan. 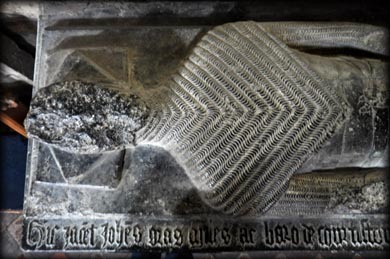 He probably died in 1552, the year marked on this monument. 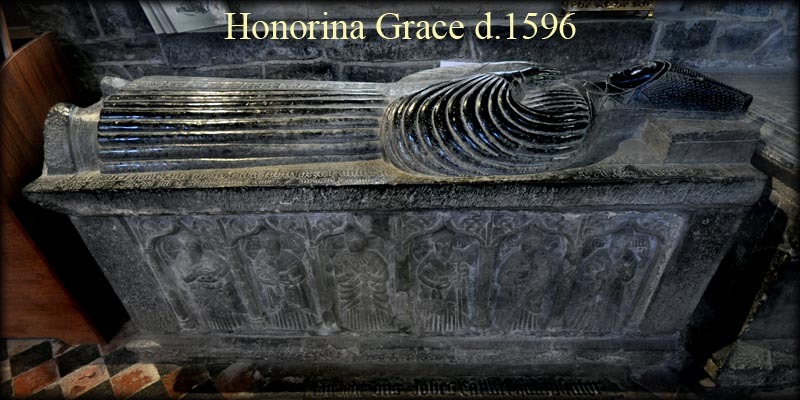 Honorina, AKA Onorina, c. 1512-1596, was the daughter of John Grace and Honoria Noreen Walsh, see above. In 1567, a pardon was granted to Onorina Grace, the widow of Oliver Shortall, a son of James Shortall, Baron of Ballylarkin. Honorina is wearing the traditional houpolande dress with a long ornate buckled belt, similar to Margaret Fitzgerald in the top image. The sculptor has also depicted both of these ladies wearing a highly decorated two-horned head-dress. 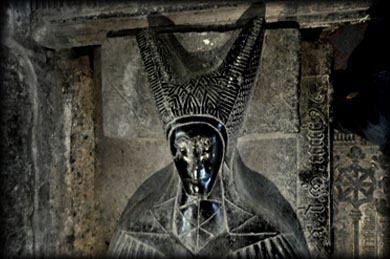 Rory O'Tunney, the sculptor, used a bit of artistic license with the head-dress. 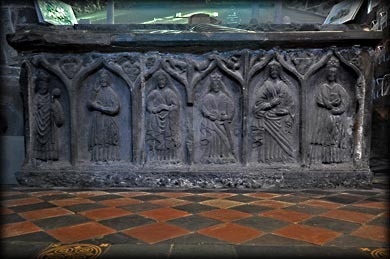 The tomb weepers include, St Philip, St Bartholomew, St Matthew, St Simon, St Thaddeus and St Mathias. In the south aisle of the nave is an effigy of an unknown lady, she is dressed as a nun, and is surrounded by five female Saints and a Bishop, see image below. It is believed to be Dame Elicia Butler, the notorious abbess of Kilculliheen nunnery in County Waterford. She was accused of assault and fornication by her community, during the early part of the 16th century. Situated: Very easy located in the centre of Kilkenny Town. From the castle head north along High Street onto Parliament Street and Irishtown. The Cathedral is at the end of this street. Discovery Map 67: S 5025 5643. Last visit Sept 2017.